David (Dave) Wetherell, US Army Ret. 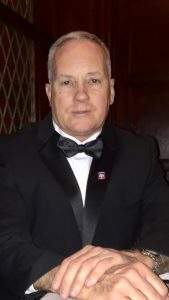 David served 27 years in the United States Army’s 82nd Airborne Division, additionally serving with the 5th Special Forces Group (Airborne), in a Team Leader capacity for the groups Chemical Reconnaissance , & Weapons of Mass Destruction Operational Detachment. A break in active military service (1994-2001) led to a tactical law enforcement officer stint as a state & federally sworn Tactical Team Leader, specializing in K-9, man tracking, high risk warrant service, gang suppression, and undercover narcotic operations. In 2001, Dave re entered military service in support of the war on terrorism officially retiring in 2009 following multiple combat deployments. Currently working for The U.S. Department Of Veterans Affairs as a Vocational Rehabilitation Specialist assisting Veterans with readjustment counseling, life skills, employability, and education options. Proud to serve as a motivator’ not an enabler…..
Married to wife Deanna (20 years), who’s a former law enforcement officer, current teacher, and full time Mother for Lorelei Grace, and Cassidy Diana. Education includes; Conflict Resolution (U.S. Army) ; BA in Business Management, Aero Space Education, Leadership, & Criminal Justice.